Linden flower tea may be your new go-to beverage when you are suffering from common ailments such as indigestion, a cold, or a headache. Often used as a diuretic, this healthy tea strives to boost your immunity and rid your body of disease. However, as with all natural remedies, speak with your physician first, especially if you take prescribed medications such as Lithium, as linden tea may interact with the drug. Linden is a tree. It is in the same species as the Tilia, or lime, tree and grows in Europe, Asia and North America in temperatures that are not consistent. The northern areas of these countries are perfect for growing these tall trees that often stand up to 90 feet tall. The trees leaves drop in the fall, but the tree can live up to 1,000 years. These early-blooming trees have flowers that exude a strong, sweet smell- one that often carries over into the tea. The dried lime flower blossom in addition to the leaves are used to make Linden tea. Even the wood from these trees which is turned into charcoal has been used for medicinal purposes. What is Linden Tea Good For? Linden tea may provide relief for all the above conditions. This herb is helpful is creating sweating which can boost a fever and help your body fight infection. What Does Linden Tea Taste Like? Although often referred to as the lime flower, linden tea does not taste like the small, green, citrus fruit. It does have a sweet, pleasant taste due to the strong aroma from the flowers, which also produce a sticky substance to make honey. You may find the tea delicious on its own as it has a strong flavor. If the flavor of Linden tea does not agree with your, but you still want the health benefits, you can pair the tea with others such as peppermint or chamomile. Chamomile will help to increase the anti-anxiety benefits of linden tea. If the taste is too sweet, you can calm it with cream or with with teas that have the opposite flavor such as green tea. Choose decaffeinated options if you are using the beverage to help you sleep. The anti-spasmodic properties are helpful to those suffering from muscle spasms, IBS, or excessive gas and bloating. The anti-inflammatory benefits of linden tea can be used internally to provide relief from conditions such as rheumatoid arthritis or externally, applied to the skin to help with conditions such as cellulitis or edema- skin swelling. If using linden tea as a diuretic, you may find relief from high blood pressure and incontinence. Linden tea’s sedative properties are beneficial to those who need help sleeping, or to reduce their anxiety. Tilia cordata, one of the linden trees that is small-leafed and Tilia platyphyllos, the larger-leafed tila species, both contribute to the benefits of linden tea. 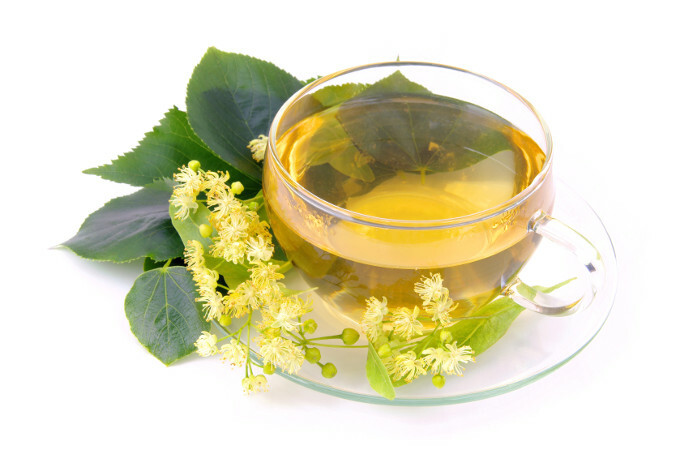 The flavonoids in linden flowers are what provide the immune-boosting and antioxidant benefits of linden tea. Also in the flowers, is volatile oil which helps to reduce anxiety. According to the University of Michigan, linden tea is part of the “nerve tonic” group which is beneficial to those suffering from anxiety. The mucilage components of the flowers and leaves are what help to reduce inflammation. Are There Any Side Effects from Linden Tea? The benefits of Linden tea have not been promoted for use in children, so speak with your health care provider before giving the tea to a child. Females who are pregnant or nursing should also avoid the tea, as its safety has not been monitored for this population. For adults who use the recommended dosage, side effects are limited. You may experience an allergic reaction in the form of hives or skin irritation. If so, please discontinue use immediately. Linden tea may interfere with other medications or conditions. Since it is a diuretic, it may contribute to an excess of Lithium remaining in your system, so speak with your doctor about adjusting your dosage if you take Lithium. If you already take a diuretic, also check with your doctor or pharmacist to determine if linden tea will interfere. If you have an existing heart condition, check with your physician first, as linden tea has been linked with heart damage. The dried flowers and leaves from the linden tree are used to make tea. You can purchase pre-made teas, or purchase the dried flowers and make your own tea. The dosage will vary depending on your age, weight and general health, so use caution at first. Steep two to three teaspoons with one cup of boiling water for approximately 10 minutes, or until it reaches your desired taste. Let the beverage cool before you drink it or apply it to your skin. You can drink two or three cups a day. Who Can Benefit from Linden Tea? Those who frequently suffer from the common cold or who need to boost their immunity will benefit from linden tea. If you have discomfort from inflammation, linden tea may provide relief. If you suffer from frequent headaches or excessive bloating, linden tea can help reduce your discomfort. You may also turn to linden tea for its anxiety-reducing properties to help you sleep. It it useful for common ailments not just rare conditions or diseases. You can add this your daily routine to help strengthen your health. Plus, the flavor is easy to tolerate and does not have to be masked with many additions. The sweet, sticky flower substance of the linden tree is used to make a type of honey. Although referred to as the lime tree, it does not grow, or taste like the lime fruit. The small leafed tree is known as the winter linden and the larger leaf variety as the summer linden.